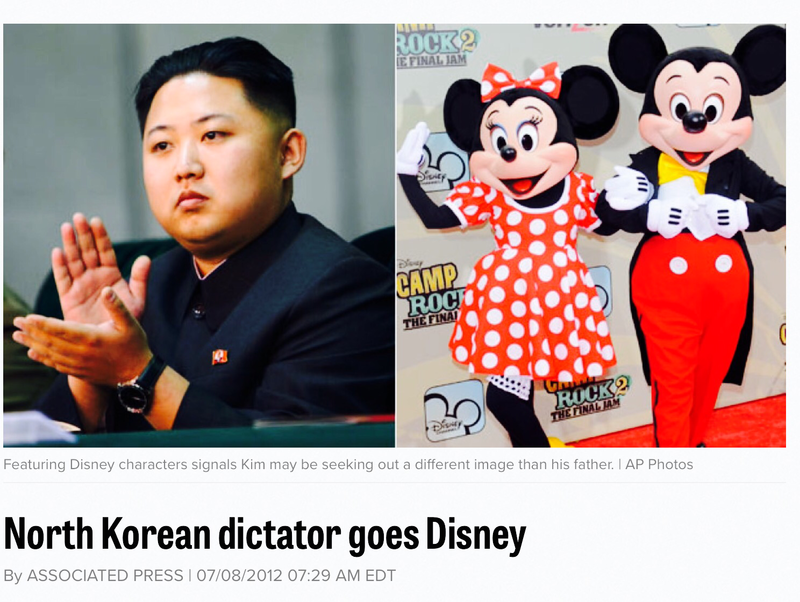 << Image Caption >> Jong Un and Mickey and Minnie Mouse are pictured. << Image Caption >> Featuring Disney characters signals Kim may be seeking out a different image than his father. PYONGYANG, North Korea — Mickey Mouse and Winnie the Pooh took the stage in North Korea during a concert for new leader Kim Jong Un, in an unusual — and unauthorized — performance featuring Disney characters. Performers dressed as Minnie Mouse, Tigger and others danced and pranced as footage from “Snow White,” “Dumbo,” “Beauty and the Beast” and other Disney movies played on a massive backdrop, according to still photos shown on state TV. The inclusion of characters popular in the West — particularly from the United States, North Korea’s perpetual enemy and the leading patron of South Korea — is a notable change in direction for performances in Pyongyang. Actors and actresses also showed off new wardrobes, including strapless gowns and little black dresses. Kim himself established the group that performed, and the changes may be a sign that he is seeking to carve out a different image from his father and predecessor, Kim Jong Il, by easing restrictions on Western culture, said Koh Yu-hwan, a North Korean studies professor based in Seoul, South Korea. Under Kim Jong Il, who died in December, North Korea became well known for its massive Arirang shows, synchronized dance and gymnastics shows involving up to 100,000 people. This appears to be the first time Disney characters have been included in a major performance in Pyongyang, though Winnie the Pooh and Mickey have been popular among children for several years. Backpacks, pencil cases and pajamas imported from China often feature Disney characters, and stories such as “Dumbo” have been translated into Korean for North Korean schoolchildren. However, it is unusual to make such images a central part of a North Korean performance and publicize them on state TV. Zenia Mucha, chief spokeswoman for The Walt Disney Co., said the use of Disney characters in the North Korean performance was not authorized by the U.S. entertainment company. “This was not licensed or authorized by The Walt Disney Co.,” Mucha told the AP by telephone on Sunday. U.S. sanctions prohibit the importation of North Korean goods into the United States but do not ban the sales of American consumer products in North Korea unless they involve officials or companies on the U.S. Treasury Department’s sanctions blacklist. The performance was staged Friday by the Moranbong band, which was making its debut after being assembled by Kim himself, KCNA said. The dispatch made no mention of Disney characters but said the concert included the traditional folk tune “Arirang” as well as a number of upbeat foreign songs.